Critical temperatures, pressures and densities are very important for the development and improvement of Equation of States. The critical point with the critical opalescence is the most significant point for pure substance or defined mixture. The static variable volume (see figure below) can be applied for the measurement of phase equilibrium properties, critical data and volumetric properties. It can be operated at temperatures between 250 and 430 K and pressures up to 10 MPa. 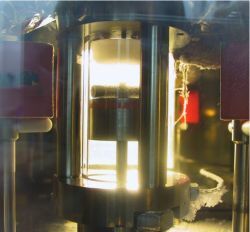 A stirred equilibrium cell consisting of a sapphire tube, which is mounted between two Hastelloy pieces, is placed in an air thermostat. Two piston pumps can be used to inject known amounts of the desired components. With the help of a pneumatically driven micro sampler (ROLSI: rapid on-line sampler-injector) at the top of the cell very small samples can be withdrawn. They are directly injected into the carrier gas stream of a gas chromatograph. The position of the sampler can be varied in order to analyze all phases. Because of the very small sample size the equilibrium inside the cell is not disturbed. 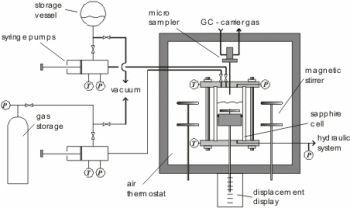 In order to avoid condensation and adsorption of high boiling components, the micro sampler and the lines for the gas stream of the gas chromatograph are superheated. In order to enable the sampling, the pressure inside the cell has to be larger than the pressure of the carrier gas stream of the gas chromatograph. For this purpose, at low system pressures an inert component (helium) can be added to the cell. 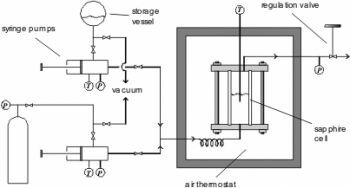 A variable volume of the cell is enabled by a hydraulically movable piston, and the change of the position can be observed with the help of a displacement measurement, so that also volumetric conclusions can be drawn. For the pressure measurement a calibrated pressure sensor is connected to the cell. The temperature is measured at the top and at the bottom of the cell using Pt100 platinum resistance thermometers. Also critical properties (T,P,v) can b﻿e﻿ m﻿﻿﻿﻿﻿﻿﻿﻿﻿easur﻿ed ﻿﻿﻿﻿﻿with this apparatus. Therefore, the exact volume conditions of the cell can be determined. A defined amount of substance is injected into the cell, and then the temperature is increased, ﻿﻿whereby the phase border is kept in the middle of the cell (compare flow apparatus) by adjusting the volu﻿﻿﻿﻿me of the cell. Approaching the critical temperature the change of the phase border is very strong and fast, so that the critical volume can be derived from these measurement. Finally, when the critical point is reached, the disappearance of the phase border and the critical opalescence can be observed. 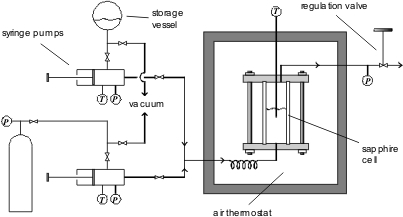 The flow apparatus (see figure below) can be applied for the determination of critical temperatures and pressures of pure components and mixtures. It can be operated at temperatures between 280 and 700 K and pressures up to 35 MPa. Two thermoregulated chromatographic syringe pumps, which contain the pure substances (e.g. liquefied gases), can provide a flow of defined constant composition. When liquids are studied, inert components (e.g. air) have to be removed by degassing before filling the pumps. After a short heating section the mixture enters a sapphire cell from the bottom. The cell is placed in an air thermostat. A regulation valve is placed behind the upper outlet of the cell. This valve can be operated manually in a way, that the system can be kept in the two-phase state. The volume of the cell is about 10 cm3. The temperature is measured with a Pt100 probe inside the cell. For the pressure measurements sensor between the outlet of the cell and the regulation valve is used. The measurement starts with a constant flow and closed regulation valve until half of the equilibrium cell is filled with liquid. Then, the regulation valve is adjusted, so that the position of the liquid-vapor phase boundary is kept at a constant level. While increasing the temperature, the position of the phase border will change. This effect can be compensated with the help of the regulation valve. A little below the critical temperature the phases become cloudy and the disappearance of the meniscus can be observed. 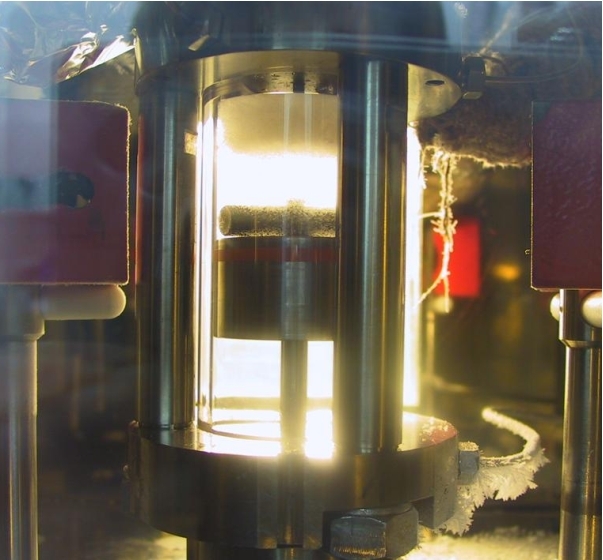 When the critical temperature is exceeded, only one transparent supercritical phase is left. Subsequently, the reappearance of the meniscus can be observed by a slight opening of the regulation valve and the corresponding temperature and pressure drop.